Sorting waste and fighting food waste are daily challenges faced by collective catering. Whether for cooking or tray leftovers, the focus has long been on adapting meal composition and distributions, an adjustment of prepared and served quantities and an increasing awareness of school staff and pupils. Recycling waste through sorting is generally adopted, as for food waste compost repurposing. However, it is difficult to reliably and fully estimate their quantities. 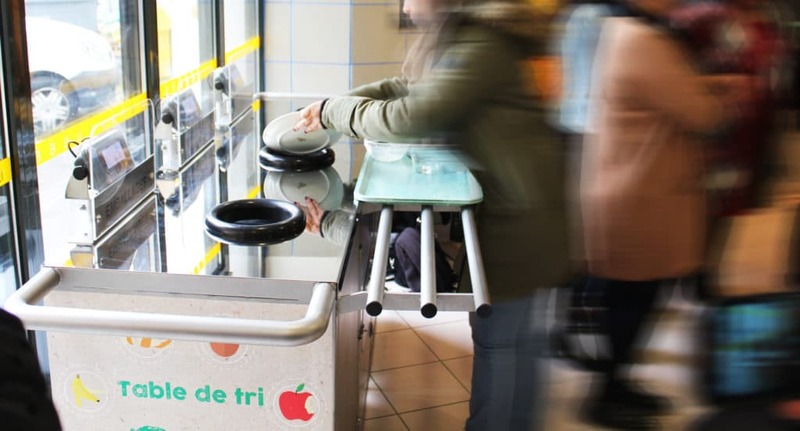 The waste sorting and weighing table offers reliable and factual indicators of waste type and volume to implement bio-waste collection and repurposing measures. The follow-up of the weigh will give value to everybody’s efforts in this eco-citizen approach. The waste sorting and weighing table is entirely made up of stainless steel. The weighing function is completely integrated and the weight display is ensured by the i5 indicator, that PRECIA MOLEN offers since mid-2016. Mobile and equipped with ramps for the handling of the three bins, it makes operations agents’ work easier. It comes in various configurations (gates in option, number of bins, …) according to requirements or the installation. Waste sorting and recycling have long been at core of PRECIA MOLEN’s environmental approach. 82% of total waste quantities are repurposed! Today, 100% of wood, rubble, and metal waste are sorted and recycled with specific collections. These collections have, for example, led to the use of wood packs in Ardèche’s boiler rooms up to 17 tonnes in 2015, that is the equivalent of 6000 litres of fuel oil. PRECIA MOLEN is also a key player in the environmental sector. Our specific weighbridges, weighing terminals, and access control products offer product flow management solutions for waste processing and recycling centres.